Gebauer R, Volarík D, Urban J, Børja I, Nagy NE, Eldhuset TDø, Krokene P (2019). Effects of mild drought on the morphology of sun and shade needles in 20-year-old Norway spruce trees. iForest 12: 27-34. Effects of the interaction between drought and shade on water relations, gas exchange and morphological traits in cork oak (Quercus suber L.) seedlings. Forest Ecology and Management 210: 117-129. _lme4: Linear mixed-effects models using Eigen and S4_. R package version 1.1-7. Shade effect alters leaf pigments and photosynthetic responses in Norway spruce (Picea abies L.) grown under field conditions. Photosynthetica 44: 227-234. Springer International Publishing, New York, USA, pp. 123-142. Limited variation found among Norway spruce half-sib families in physiological response to drought and resistance to embolism. Tree Physiology 36: 252-266. Drought affects tracheid structure, dehydrin expression, and above- and belowground growth in 5-year-old Norway spruce. Plant and Soil 366: 305-320. Canopy structure and vertical patterns of photosynthesis and related leaf traits in a deciduous forest. Oecologia 96: 169-178. Effect of thinning on the anatomical adaptation of Norway spruce needles. Tree Physiology 31: 1103-1113. Effects of prolonged drought on the anatomy of sun and shade needles in young Norway spruce trees. Ecology and Evolution 5: 4989-4998. Water relations of Picea abies. I. Comparison of water relations parameters of spruce shoots examined at the end of the vegetation period and in winter. Physiologia Plantarum 83: 290-295. Specific leaf area and needle weight of Norway spruce (Picea abies) in stands of different densities. Canadian Journal of Forest Research 15: 389-392. Are species shade and drought tolerance reflected in leaf-level structural and functional differentiation in Northern Hemisphere temperate woody flora? New Phytologist 184: 257-274. Norway spruce physiological and anatomical predisposition to dieback. Forest Ecology and Management 322: 27-36. Combined effects of shade and drought on tulip poplar seedlings: trade-off in tolerance or facilitation? Oikos 90: 67-78. Cell structural changes in the needles of Norway spruce exposed to long-term ozone and drought. Annals of Botany 92: 779-793. Moderate drought alters biomass and depth distribution of fine roots in Norway spruce. Forest Pathology 43: 115-123. Specific leaf area and leaf area index in developing stands of Fagus sylvatica L. and Picea abies Karst. Forest Ecology and Management 364: 52-59. Norway spruce needle size and cross section shape variability induced by irradiance on a macro- and microscale and CO2 concentration. Trees-Structure and Function 32: 231-244. Vertical profile of needle biomass and penetration of radiation through the spruce stand. Ekologia 21: 107-121. Physiological response of irrigated and non-irrigated Norway spruce trees as a consequence of drought in field conditions. European Journal of Forest Research 131: 1737-1746.
lmerTest: tests in linear mixed effects models. R package version 2.0-25. Does the azimuth orientation of Norway spruce (Picea abies [L.] Karst.) branches within sunlit crown part influence the heterogeneity of biochemical, structural and spectral characteristics of needles? Environmental and Experimental Botany 59: 283-292. The impact of long-term CO2 enrichment on sun and shade needles of Norway spruce (Picea abies): photosynthetic performance, needle anatomy and phenolics accumulation. Plant Science 188: 60-70. Effects of light availability and tree size on the architecture of assimilative surface in the canopy of Picea abies: variation in needle morphology. Tree Physiology 15: 307-315. Distribution patterns of foliar carbon and nitrogen as affected by tree dimensions and relative light conditions in the canopy of Picea abies. Trees-Structure and Function 11: 144-154. An analysis of light effects on foliar morphology, physiology, and light interception in temperate deciduous woody species of contrasting shade tolerance. Tree Physiology 18: 681-696. Global-scale climatic controls of leaf dry mass per area, density, and thickness in trees and shrubs. Ecology 82: 453-469. Photosynthetic efficiency of Betula pendula acclimated to different quantum flux densities. Plant Cell and Environment 5: 9-15. Within-crown foliar plasticity of western hemlock, Tsuga heterophylla, in relation to stand age. Annals of Botany 88: 1007-1015. Tradeoffs between hydraulic and mechanical stress responses of mature Norway spruce trunk wood. Tree Physiology 28: 1179-1188. Canopy transpiration and water fluxes in the xylem of the trunk of Larix and Picea trees a comparison of xylem flow, porometer and cuvette measurements. Oecologia 66: 475-483. Estimating needle area from geometric measurements: application of different calculation methods to Norway spruce. Trees - Structure and Function 14: 215-222. Morphological and stomatal responses of Norway spruce foliage to irradiance within a canopy depending on shoot age. Environmental and Experimental Botany 45: 115-131. Within-crown variation in leaf conductance of Norway spruce: effects of irradiance, vapour pressure deficit, leaf water status and plant hydraulic constraints. Annals of Forest Science 61: 419-429. Interactions of thinning and stem height on the drought response of radial stem growth and isotopic composition of Norway spruce (Picea abies). Tree Physiology 32: 1199-1213. Differences in transpiration of Norway spruce drought stressed trees and trees well supplied with water. Biologia 68: 1118-1122. Mechanistic differences in utilization of absorbed excitation energy within photosynthetic apparatus of Norway spruce induced by the vertical distribution of photosynthetically active radiation through the tree crown. Plant Science 133: 155-165. Drought stress alters the concentration of wood terpenoids in Scots pine and Norway spruce seedlings. Journal of Chemical Ecology 29: 1981-1995. A simple method for distinguishing within- versus between-subject effect using mixed models. Animal behaviour 77: 753-758. Impact of four years exposure to different levels of ozone, phosphorus and drought on chlorophyll, mineral nutrients, and stem volume of Norway spruce, Picea abies. Physiologia Plantarum 114: 192-206. 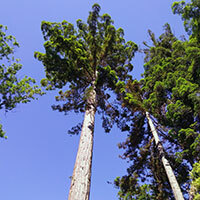 Does turgor limit growth in tall trees? Plant Cell and Environment 27: 229-236. Morphological and quantitative data of plastids and mitochondria within drought-stressed spinach leaves. Protoplasma 223: 221-227.